Sunrisres Hyderabad 2-174 (Shikhar Dhawan 71, Parthiv Patel 52, Thisara Perera 32*, Shehan Jayasuriya 1-25) beat Kandurata Maroons 3-168 (Kumar Sangakkara 61*, Lahiru Thirimanne 54, Ishant Sharma 2-20) by eight wickets. Kandurata Maroons managed 168 runs for the loss of three wickets in the allotted 20 overs and Sunrisers Hyderabad piled up 174 with 8 wickets in hand and 9 balls remaining. 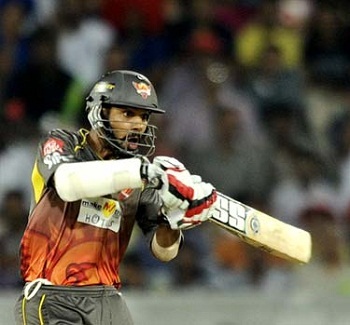 Shikhar Dhawan (Sunrisers Hyderabad) was declared ‘Player of the match’ for his brilliant knock of 71 off just 53 balls. The second qualifying match of the Champions League 2013, was played on Tuesday, September 17, 2013, at Punjab Cricket Association Stadium, Mohali, Chandigarh. Earlier, Shikhar Dhawan won the toss for Sunrisers Hyderabad and put Kandurata Maroons in to bat first. Upul Tharanga and Shehan Jayasuriya opened up smartly as the first hit 4 fours on 12 balls he faced. Tharanga was caught behind by Parthiv Patel off Ishant Sharma for 19 and his partner followed him after scoring just four runs. The run machine in all formats of the game, Kumar Sangakkara along with Lahiru Thirimanne took over the responsibility of scoring runs. The boundaries started showering and the latter hit a couple of sixes in the coming overs. Sangakkara hit his third four in the 14th over and posted the hundred of the innings as well whereas Thirimanne reached his 2nd T20 fifty two overs later. The latter was clean bowled by Ishant Sharma for 54 off 39 balls with 2 high sixes and 5 fours. Kumar Sangakkara dispatched his 22nd T20 half century and remained unbeaten for 61 off 46 with 7 fours. Dilhara Lokuhettige was at the other end at 21 as Kadurata Maroons scored 3-168 in 20 overs. Ishant Sharma was the top wicket taker with two whereas Darren Sammy claimed one. Parthiv Patel and Shikhar Dhawan went into chase with a positive approach while hitting 7 fours in the first five overs. Dhawan added three consecutive fours in the next one followed by another two in the 8th over. Patel gathered three boundaries in the coming overs and both batsmen registered their fifties in the shortest form of the game in the 12th over. The opening wicket partnership was broken at 121 after 13.5 overs when Parthiv Patel was caught by Lahiru Jayaratne at deep midwicket off Jayasuriya for 52 from 42 deliveries with 7 fours. Shikhar Dhawan was caught by Nuwan Kulasekara at backward square leg off Ajantha Mendis for 71 scored from 53 with 11 fours. Jean-Paul Duminy and Thisara Perera joined in next as the latter hit 1 six and 3 fours until the end of the 18th over. 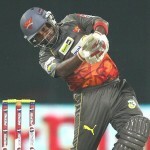 Perera smashed another six on the third delivery of the next one and surpassed the required target. He stood firm by scoring 32 off just 11 balls with 2 lofty sixes and 4 fours, Duminy held his end for 6 as Surisers Hyderabad amassed 2-174 runs. They won the qualifying game with a big margin of eight wickets and gained four points.